The Japanese 17th-century master swordsman, Miyamoto Musashi, used the name 二天一 (Niten Ichi - "two heavens as one") for his fighting technique of using both swords at once. The name 二天一流 (Niten Ichi Ryū) refers to the Niten Ichi school or Niten Ichi style. The first time I heard Ni Ten it was like a shot right into my mind's eye and I could see Tomisaburō Wakayama chopping people's heads off as the perfect instrument of revenge. The Fifth Column is the one I can play regularly though, that ding dong gong is MASSIVE. Does anyone have full audio of the Dubplate version of ni - ten - ichi - Ryu ? Thank god this was written. Thank god not all jungle sounds like this. Complex, sophisticated, cutting-edge & hugely listenable. It's a record that keeps Has deconstructed not just the beats and the rhythms, but one's perception of Drum & Bass. Photek's best work in my opinion. A must-own record for any discerning D&B enthusiast. 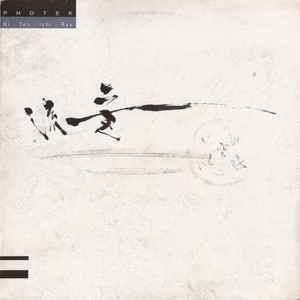 'Ni-Ten-Ichi-Ryu' is certainly the KILLA track to hear on this 12"... In fact, for me, it represented the pinnacle of Photek's (a.k.a. Rupert Parks') programming abilities, showing why his cutting edge sound continually broke through barriers of what Drum & Bass could be time and again. No one came close to making beats like these... Why, we may never know. Perhaps no one was as daring as Parks was... Maybe it was for fear of never quite getting it as far-out sounding as Parks had, and thereby being shredded to pieces by his ferocious creations, most of which (I remember reading somewhere) were fuelled by a habit of extended waking hours (36 hours awake and then 12 hours of sleep). Who else could get near these razor-sharp arrangements? Not many. Certainly the style of his creations cut to the heart of Drum & Bass like nothing else had before. I first remember hearing this track down at TEMPO... When it came on, we totally stood in awe. When Grooverider had dropped it, it had sliced through the club like a Ronin might slice through his enemy... Our minds cleaved apart as though a Japanese folded steel blade had passed through us. Rewind once... Rewind twice... Rewind a third time... We went wild for it! All those usual fresh rhythmic patterns that were flooding in from new blood like John B and other young producers, were cut down to size when set against the complexity of this Akira Kurosawa tinged vision that instilled a type of tension in one that you'd expect only to get at an Iaido match. TEMPO, which was - at the time - being held in the Velvet Rooms on Tottenham Court Road, sort of continued on from where SPEED left off. However, despite being put together by Grooverider and Fabio, it never really took off like SPEED did. Still, there were moments down there that saw some great evolutions in the form i.e. tracks like Matrix's "Mute" and "Junk", along with Optical's "Grey Odyssey", all of which rumbled the dance floor with satisfaction... However, the push to really expand and go beyond what was being done in Drum & Bass had already happened. To go beyond this would be to leave Drum & Bass behind altogether. Saying that, when Grooverider spun this track down there, you felt as though you were actually back at SPEED, at the cutting edge of Drum & Bass once again... Hearing things that you never imagined were possible. For me, this track almost left Drum & Bass behind. It was this daring of Photek's that, when put in context of all the other tunes, shows how far beyond anything Drum & Bass it actually went. Released on a Virgin sub-label, Science, (which I believe Photek setup after Virgin signed him) most of the tracks released on this imprint never really amounted to much. But perhaps that's what happens when you create something as great as this. Certainly this track has to be heard to be believed... But it has to be kept in context too... I've played it to people who never really got into Drum & Bass and many just didn't get it. If you can follow most of the music that was coming out between 1995 and 1997, you'll see exactly why this set the standard. This is some of Photeks' best work. Both sides are great, Ni Ten Ichi Ryu especially. Taken from a Japanese form of combat, NI-TEN-ICHI-RYU shows Photek's samurai beat skills as their sharpest. Integrating the sounds of swordplay into the percussion, the track sounds cold and furious, even with its shakuhachi interlude. "The Fifth Column" has some gongs instead to accompany the chilly breaks for a similar feel -- down to the flute-pause. I was never a huge Drum & Bass/Jungle fan. Some very cool stuff out there but on the whole I could take or leave the majority of it. However Photek absolutely killed me! Some of the best stuff I've ever heard. This record in particular is just timeless. At any time I've played it since it was released until now it always sounds killer. Probably one of Photek's best work ever made on Virgin's sublabel Science (set up to release dnb productions from Photek and Source Direct). The track Ni Ten Ishi Ryu; originated by Japanese Ishi Yama Ryu who crafted this special swords technique for more then fifteen years to develope the unique 'Cut back Cut' Two Swords Technique) this can be heard in Rupert Parkes highly original release with it's most intricate complex beat programming and seductive hypnotic subbass lines. A true timeless masterpiece of (artcore) work, this classic was recently remixed by Norwegian dnb producer Teebee. Around 1997, the time this record came out, lots of guff was being talked about “intelligent” drum ‘n’ bass, of which this record is a prime example. I don’t honestly know whether this record is better than “Super Sharp Shooter” but it’s totally different to nearly every d’n’b record that has been made before or since. The A side combines amazing crispy breaks, a sinister bassline that sounds like it was played on a giant radiator, and really breathtaking drum programming, together with some eerie samples of wind and swordfights from a Japanese film. The end result would clear a dance floor in about 2 seconds but stands out as a really brilliant and atmospheric piece of music that just draws you in. Plus you can play it to your drummer friends and watch them weep like children. The B-side is more minimal and features some idiot hitting a saucepan every few bars.